Hard as nails. The definitive street fighter. It all started because we liked the idea of it. Its success is proof we are not alone. The sound, character and sheer power of the 1,050 cubic centimeter triple engine delivering 130 horsepower is at the heart of this stripped-for-action rebel. Iconic twin headlamps, tapered aluminium Magura bars, black multi spoke alloy wheels, minimalist rear section with clear lens LED rear light and twin short exhaust cans. Minimalist the styling may be, but when it comes to specification maximum is the more appropriate descriptor. Twin Brembo four-piston four-pad radial calipers mounted on fully adjustable black anodised Showa USD forks. Fully adjustable Showa monoshock rear suspension. Single sided swing arm. The Speed triple is tougher than ever and determined to defend its rightful position as the definitive factory streetfighter. 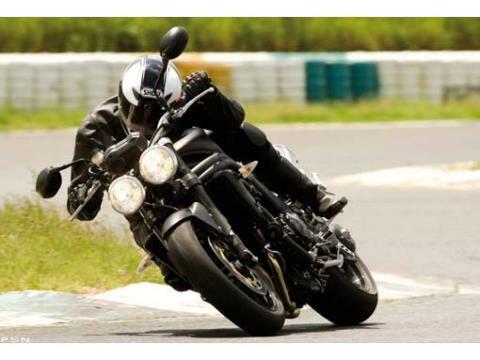 The Speed Triple’s 1,050cc, three-cylinder engine, with its unmistakable character and sound, pumps out a great surge of bottom-end torque, massive mid-range punch and an impressive level of overall power. Peak power is 130 bhp at 9,250 rpm while peak torque of 77 foot-pounDual Sport arrives at 7,550 rpm. Triumph’s Keihin ECU offers sophisticated mapping for quicker starting, cleaner running and fuel economic engine. The Speed Triple’s rear-end has sharp, minimalist styling and features a new rear sub-frame, polished stainless steel heat shielDual Sport and repositioned ball burnished aluminum pillion footrests to give the pillion rider more leg room. It also sports a clear-lens LED rear light. 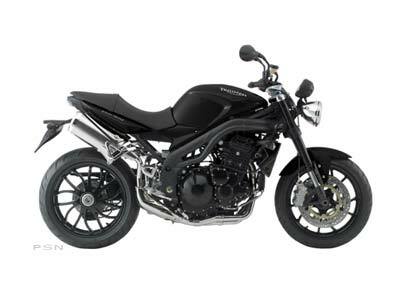 The fully adjustable 43 mm upside down forks and rear monoshock add superb levels of quality and control, while the new black anodized finish to the front forks amplifies the Speed Triple’s rebellious look. Multi-spoke alloy wheels add to the Speed Triple’s street fighter attitude.